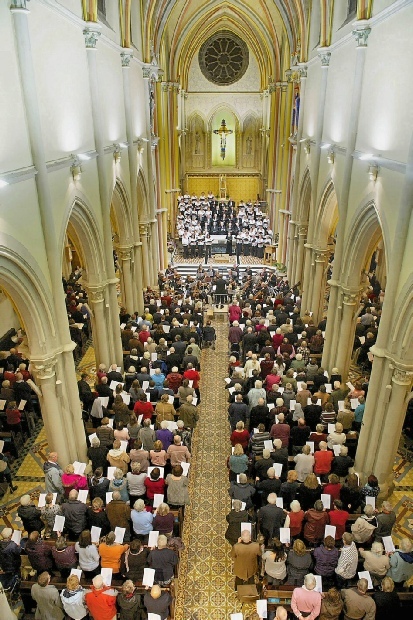 Christmas is often a busy time for the choir and this year the choir sang at 16, New Street (for the National Trust), the Annual Soup Kitchen (in aid of the Shelter Trust) and the Festival of Carols at St. Thomas church. "May I have the courtesy of your columns to thank the audience who packed out St Thomas’ Church on Wednesday 17th December, on a wet and windy evening, for their generosity in raising the sum magnificent sum of £3000 for the Jersey Association of Youth and Friendship. Giving at this time of year is always difficult with so many demands, but the Jersey audience really rose to the occasion – as did all the performers! I must thank Acappella Brass for their thrilling fanfare to set the scene; for their entertaining music as people started to arrive an hour and a half before the start to secure seats in the Nave and for their galloping “Dance of the Tumblers” later in the programme. Angela Luce led her Holmchase Singers in three beautiful carols, especially deserving our thanks for their annual contribution to the Festival of Carols, culminating in the ever popular “Minuit Chrétiens” when they joined the full choir with Sue de Gruchy on her plangent guitar. The men of the Festival Choir had a unique opportunity to show their control and quality with a Medieval chant to set the scene and the treble solo from the organ loft by Oliver Scott held us all spellbound. Thanks are also due to the skills of the accompanist, Grace Garnier, who was joined by Sam Bisson in the technically demanding and brilliant carol “Bring a Torch Jeanette, Isabella” and the flautist Helen Reid who also contributed her skill to add variety and beauty to the tuneful “Shepherd’s Pipe Carol”. Sadly, the breakdown of the organ prevented us from hearing Kenneth Francis’ solo, but the St Cecilia Orchestra, flamboyantly conducted by the inspirational Gerard Le Feuvre, gave us all a drive and an energy which compensated for its loss. The orchestra was also a moving accompaniment for Imogen Nicholls’ recitatives leading the choir into “Glory to God”, a rousing chorus from “Messiah” – a very appropriate and spirited addition. As always we are enormously grateful to Monsignor Nicholas France for allowing us to use (and disrupt with scaffolding!) his Church at such a busy time for this annual celebration. He has always been a marvellous supporter of the event. Without the leadership of Elizabeth Farnon, the Choir Mistress of the Festival Choir, and her co-conductor for this concert, Sue de Gruchy, none of this would be possible, and they deserve all our thanks and appreciation for their dedication and commitment. 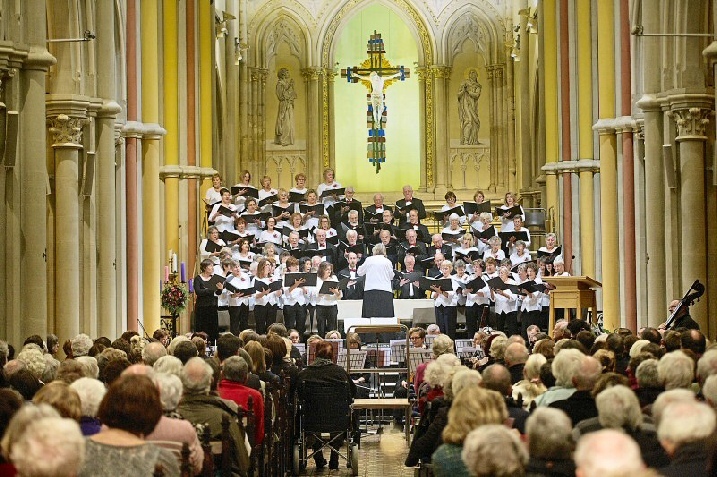 The prolonged applause, which greeted the final chords of Minuit Chrétiens from a congregation which had withheld it so patiently for the whole evening, was thanks enough to all the performers and a fitting end to a truly uplifting Christmas celebration. The Choir will be next performing “Messiah” on April 25th at St Helier Methodist Centre, with returning soloist Mark Le Brocq, and local singers Gabrielle Cassidy, Georgia Mae Bishop, and joined by baritone Matthew Durkan, so that is a date not to be missed!" "JAYF provides supervised accommodation to young adults (from 16 years old) who might otherwise be homeless through no fault of their own. We can accommodate almost 30 young people across four hostels (normal occupancy rates are between 20 and 25), each with a live-in ‘houseparent’. Our tenants – past, present and future – have access to an experienced JAYF Counsellor (salaried), who also provides an important liaison role between JAYF and the Children’s Service and other relevant bodies. Each of our four hostels provides comfortable and safe living accommodation for our tenants, but none are new and all require regular and expensive maintenance! Our tenants do pay rent – subsidised (our weekly rents average around £65) - from their own wages if they are working (many do) or from Income Support. However, the net running costs of the Hostels and the employment of a JAYF Counsellor are around £50,000 per annum. Our funding comes from three main sources. Firstly, a small army of JAYF fund raisers organise a series of Open Gardens (including this year, Government House of course), an annual sponsored cross country horse ride, and an annual Bridge event. The costs of running these programmes are sponsored by Moore Management, which enables JAYF to benefit in full from these activities. Between £20-25,000 is raised each year by our Appeals Committee. The remainder is made up from investment income, currently £10,000 per annum, small parish grants (£4,000 in 2013) and finally we are blessed with a number of kindly individuals and trustees who, from time to time, donate or bequeath lump sums to JAYF"